"Have you been led astray, too?" the Pharisees mocked [to the Temple guards]. "Is there a single one of us rulers or Pharisees who believes in [Jesus]? This foolish crowd follows him, but they are ignorant of the law. God's curse is on them!" Smug rejection is such an obnoxious trait. Yet we see it often. When others don't want to grapple with the truth of Jesus or the perplexing and demanding challenges of genuine discipleship, they smugly look down their noses and speak of believers as idiots and imbeciles. Some do it more subtly than others, but the smug arrogance is still there. "If only you were as educated or smart or street-wise as we are, you would know that Christianity is a bunch of fluff for the weak." We need to remember, however, that many reject Jesus because his demands are hard, not because his existence is questionable. 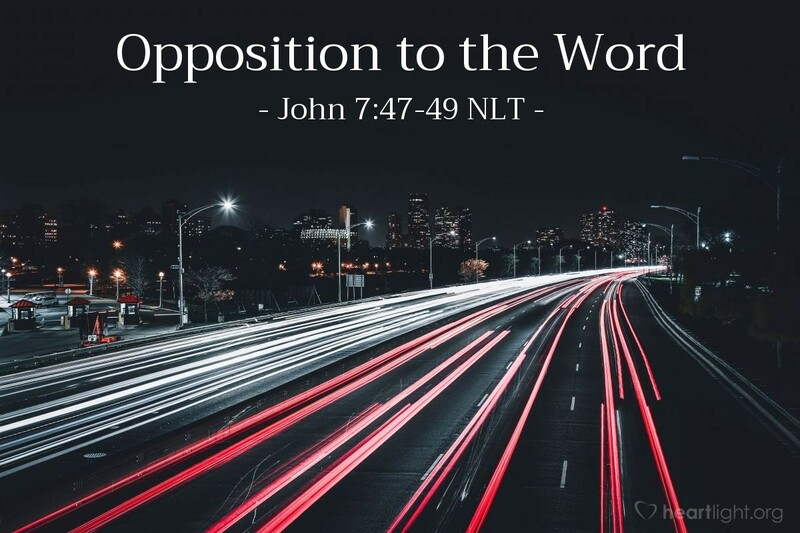 The religious opposition in Jesus' day was rooted in the religionists' not wanting to have to change their lives, their perspectives, their places of power, their positions, their... So when they could not explain Jesus away, they had to put down his followers and any who had an interest in what he had to say. If you listen closely today, you will continue to hear their voices. Just don't heed them! Decide for yourself based on what you read and see of Jesus on your own. Father, I recognize that the Gospel of Jesus doesn't exist in a vacuum. I confess that I am frustrated by several of those around me that I love dearly but who will not accept the truth about Jesus. Please grant them an open heart. Please bless them with an openness to truth. Please use me to point them to Jesus so they can decide about him honestly for themselves from an open heart. In Jesus' name, I pray. Amen.